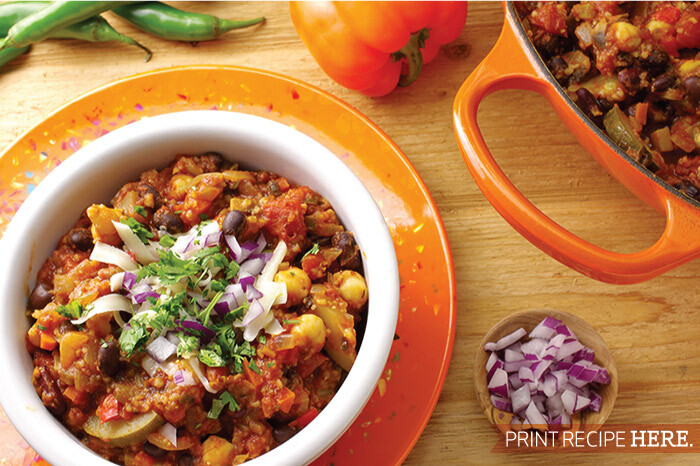 This chili is a celebration of vegetables spiked with classic chili spices. 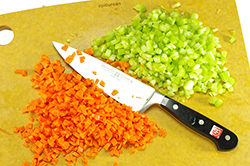 It all starts with a mélange of aromatic veggies – sort of a mire poix, chili-style, with fresh peppers, one mild, one hot. Generous helpings of spices bloom in the heat releasing their magic to the stew. The unique addition of mushrooms lends a rich umami flavor to this vegetarian version. Chosen for their different colors, the three beans provide a rich protein source along with the complementary bulgur for a full nutritional profile. 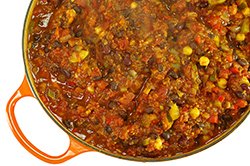 The veggie combination provides all the pleasures of chili in a lighter style. 1. 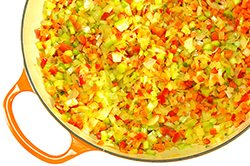 Heat the oil in a large, deep pot (5 qt. or larger). 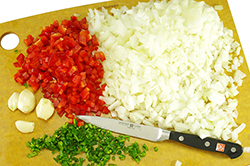 Sauté the diced onions, bell pepper, and Serrano peppers for 3-4 minutes or until beginning to soften. 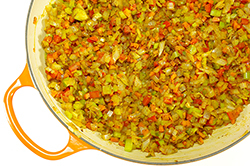 Add the carrots and celery and continue to sauté. Add the crushed garlic and sauté for another minute. 2. Add the spices (cumin, hot chili powder, oregano and thyme) to the aromatics and sauté for one minute to allow the spices to bloom. 3. Coarsely chop the mushrooms and add to the pot along with the zucchini slices. 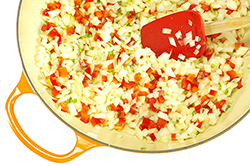 Allow any liquid released in the pan to steam away concentrating the flavors in the process. 4. Add the diced tomatoes and any juices. Stir in the tomato paste and bulgur. Add the three beans and vegetable stock. Cover and simmer over low heat for 30 minutes. Check periodically. 5. Stir in the cilantro and vinegar. Salt to taste. Serve hot with several garnishes layered on top. 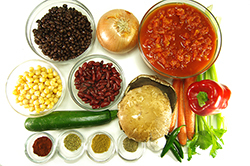 Note: For a thicker chili use additional bulgur, for a thinner, more brothy chili, use less.